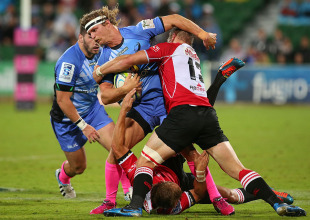 The Western Force recorded a franchise-record eighth win of the season with a 29-19 triumph over the Lions in Saturday night's Super Rugby clash in Perth. Skipper Matt Hodgson produced another Herculean display in scoring two tries - including the bonus-point fourth try - while Jayden Hayward and Chris Tuatara-Morrison also crossed. The Force's fifth straight home win lifted them to fourth on the ladder with just four games remaining. The Lions entered the match on a six-game losing streak. But apart from a disastrous four-minute period just before halftime and another bad six-minute period before the fulltime whistle, they proved to be a hard nut to crack. Time and again they repelled the Force's attacking forays, before two tries in the final six minutes finally killed off the contest. An early downpour ensured for slippery conditions, and the Force's efforts to make a strong start to the match were thwarted by a series of scrum infringements. Those penalties gave the Lions vital field advantage at several key times, and the visitors shot out to a 9-3 lead in the 28th minute when fly-half Marnitz Boshoff nailed his third penalty. But the turning point of the half came in the 35th minute when Nathan Charles was knocked unconscious as he tried to barge his way to the line. Lions prop Corne Fourie was given a yellow card for the shoulder charge, and the Force made the most of the numerical advantage with two tries in the next four minutes. Hodgson charged over for his fifth try of the season, while fullback Hayward crossed out wide just a minute before halftime to give the Force a 15-9 lead. The Force unleashed an attacking onslaught after the break, camping themselves inside the Lions' 22m for the best part of the next 20 minutes. However, the home side failed to get any reward for their hard work, with Nick Cummins' try disallowed due to obstruction, and several other attacking forays falling just short of the line. It was nervous moments when the Lions closed to three points with 15 minutes remaining. Tuatara-Morrison's 74th-minute try eased tensions, but a disastrous clearance attempt from Cummins four minutes later allowed Lions substitute Elton Jantjies to close the gap back to three points. Enter Hodgson. With the game on the line and a bonus point still on the cards, the recalled Wallaby stuck out his right hand through two defenders to touch down at the post with 90 seconds remaining. Lions coach Johan Ackerman felt Fourie was harshly done by after his head clash with Charles resulted in a yellow card. "It was a funny call, a disappointing call," Ackerman said. "On the view I had in front of me on the laptop, I couldn't see anything wrong. That's a decision that won't help the result now." Force coach Michael Foley said he was proud of his team's achievement to win eight games this year. "Some of the rugby we played was probably the best stuff we've played in the last couple of weeks," Foley said. "We didn't finish off always, but they stuck at it. And to get the bonus point at the end there was great."